Now is the time to make a list of the spring flowering bulbs and especially the tulips you need to order for planting in the autumn. 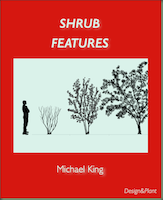 With the bulbs in flower in front of you – there is no better moment to make a plan; if you don’t, many of your inspired ideas will be forgotten when the bulb catalogues are finally published. 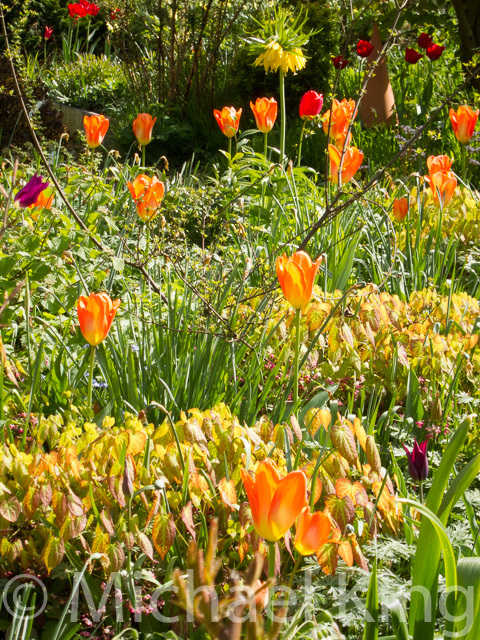 In perennial dominated plantings, spring flowering bulbs are their saviour. 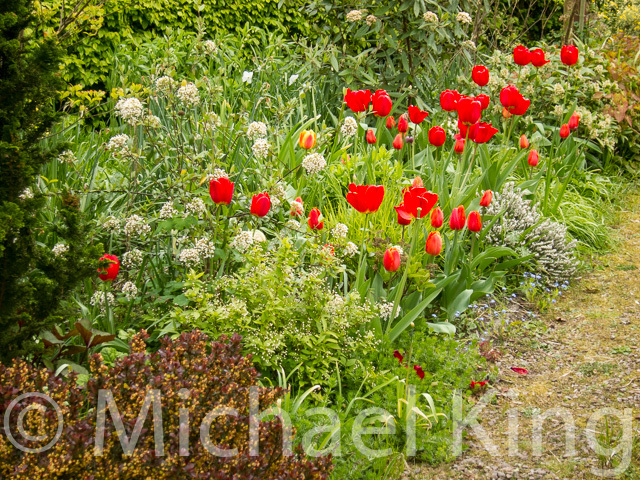 In this border in my own garden there are no tulips. 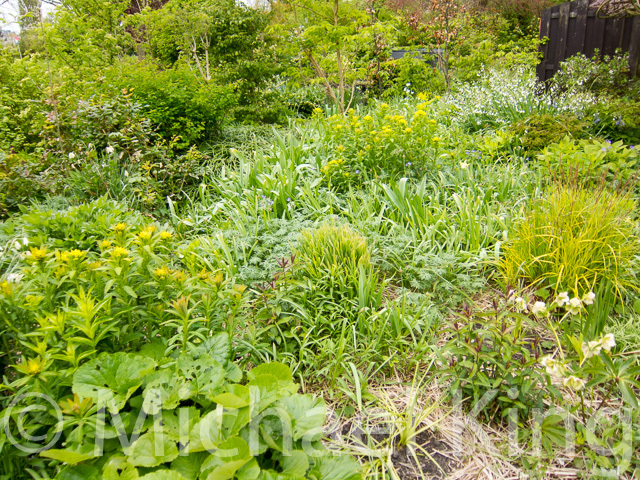 I have been adding some extra clumps of daffodils for early interest (foreground), but within a week from now there will be a mass of (Allium) onion pompom flowers to enjoy; however, at the moment this border is just green. 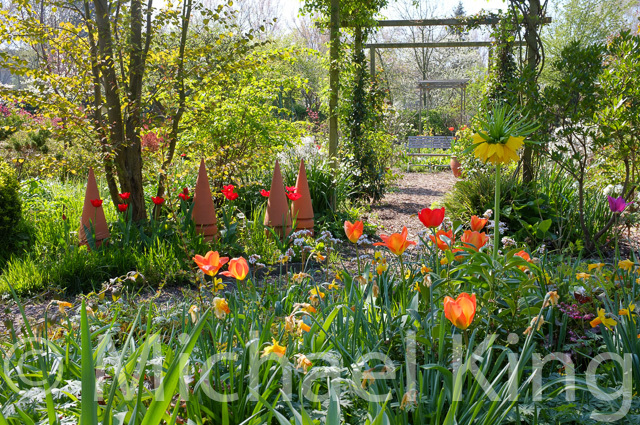 Across the path is a border featuring both daffodils and tulips that draw attention to this small area over a very long season; perhaps eight to ten weeks all told; tulips are the real stars here. 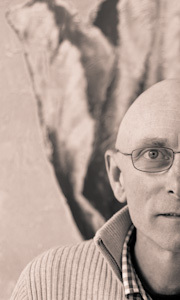 Some tulips are long lived while others are best considered as annuals. These red Triumph Group tulips – ‘Jan van Zanten’ – will need renewing this autumn. 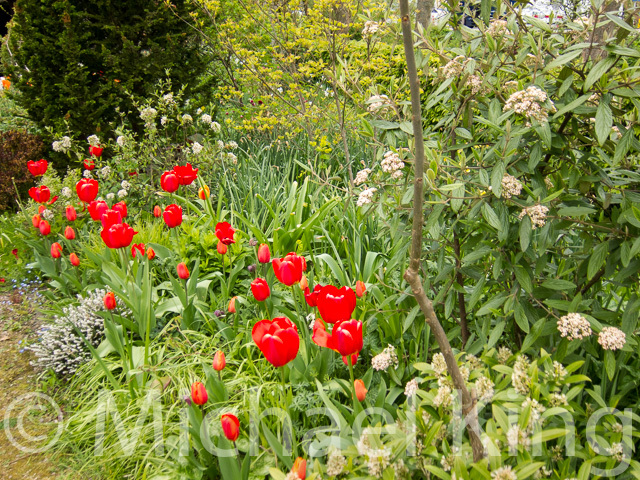 Early, mid-season and late flowering tulips are worth combining to extend their season of impact. These red Darwinhybrid Group tulips will fade in a few days time but already there is a layer of orange/red Truimph Group tulips – ‘Prins Willem Alexander’ – coming into flower under them. 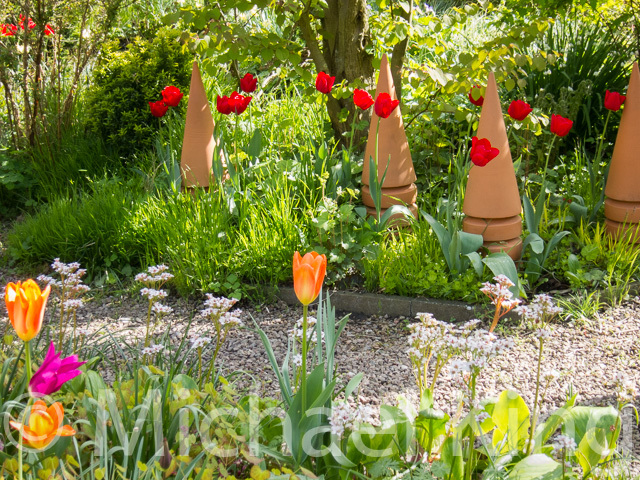 My new ebook on Tulips covers the best ways of using tulips in gardens as well as introducing you to the various groups of tulips to use in appropriate ways in your own gardens. Its time to get those bulb orders ready. This entry was posted in Tulips and tagged complementary plants, garden design, grasses, matrix planting, Perennial Meadows, theme plants. Bookmark the permalink.